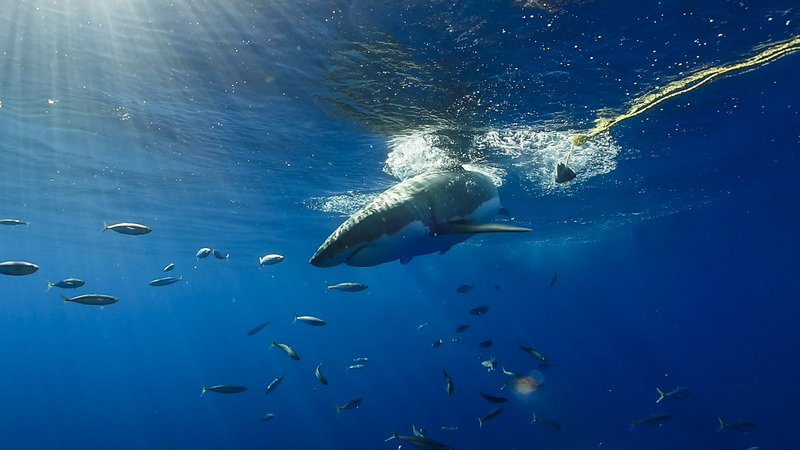 We’re on the way to Guadalupe Island, which is the best place to see great white sharks with 140ft plus visibility, loads of sharks all day, the biggest specimens around, and on one of the best liveaboards, the Nautilus Belle Amie, and her pro crew members. It is lunch time already and in a couple of hours we will be having a great white shark presentation so our guest can learn and understand what this trip is all about. 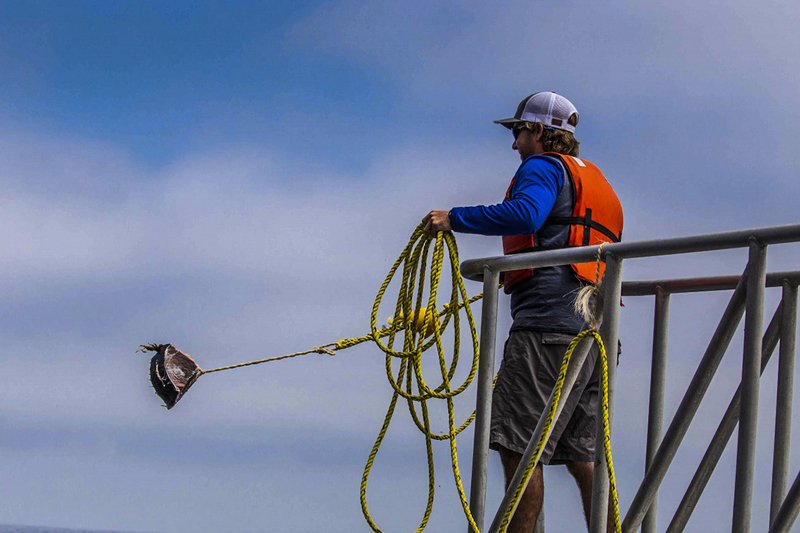 It is not just seeing a bunch of great white sharks, but it is also about learning and observing their different personalities and behaviours with scientific background information. I can’t wait! Today we had our first day at Guadalupe Island in the cages. We have been treated to 120ft+ visibility all day, 21°C water temperature and tons of sharks. The sharkiest part of the day was just before lunch, between 9-12 midday. I believe there was approximately 10-15 different sharks continuously around the ship and cages at this time. On my dives we saw up to 7 sharks at the same time, that is a lot of great whites together and something quite intimidating/awe inspiring, even in the cages. We have welcomed guests from the U.S.A, U.K, Spain, Czech Republic and Russia on this trip. So it is a Northern hemisphere trip for sure and many are enjoying escaping the cold for the beautiful blue skies and Mexican sunshine, not just the sharks! We are really starting to see a lot of large sharks regularly now, both male and female. Although the larger sharks have been around for awhile, the percentage of them is definitely increasing. When you see them directly next to a cage with you get an incredible sense of perspective and the divers look so so small. Towards the end of the day we also had large schools of huge Yellow Fin Tuna patrolling around the ship and hunting with explosive bursts of speed of over 40kph! The mackerel didn’t stand a chance unfortunately but it made for a great end to day 1! 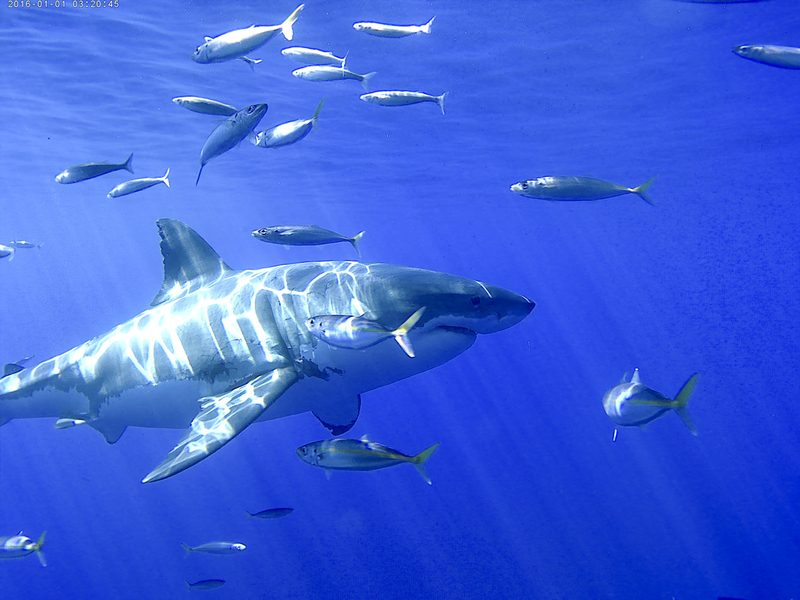 Excellent visibility at Guadalupe allows for great shark photos! Such a good first day of the trip! We have seen so many sharks in just one day, with at least 12 different individuals and most are females! Everybody is visibly happy and enthusiastic… so lets go for more tomorrow!! Today the wrangling was phenomenal; it is like being in a bullfighting plaza. The sharks were constantly making passes, trying to get the bait with out giving up, from left to right, and coming up from the bottom. It was an unusual day and due the sharks’ activity, the guests were just waiting for the right moment to capture the perfect breach. In the submersible cages, the sharks were so close to the cages that you could see their eyes looking at you when they passed by slowly. Today was a sunny day with clear skies and a beautiful sunrise. Some of our guests were enjoying the afternoon in the jacuzzi after a their dives. Visibility has been over 100ft and the water temperature has been 21°C with no change since middle of September! It was another beautiful day in Guadalupe! Yesterday was our first day of diving and it was absolutely spectacular. I saw six sharks at once three times on one of the dives in the late morning! That was one of the best dives I have ever had cage diving with great whites. It was certainly the most great white sharks I have seen on one dive. The sun has been shining on both days so far and we still have one more day to go! Today the action was hot in the morning with many sharks coming right up to the surface within inches of the surface cages. The visibility is over 120ft and the water has been a warm 74°F. What a great final day! Great viz for most of it although it dropped to about 100ft later in the afternoon (still pretty good). We had up to 8 sharks visible at a single moment! Many breaches; we had different sharks going for the same bait or both baits simultaneously at times! Something was definitely in the water today! We all enjoyed long encounters with “Lucy,” a large battle scarred female, who was escorted by around 50 pilot fish. 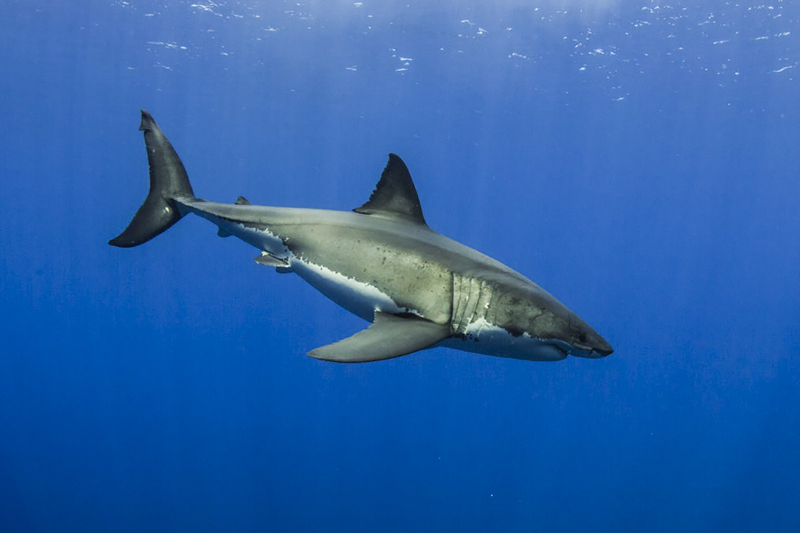 This is a large number of these shark companions and is probably due to her comparatively slow cruising speed due to her damaged caudal fin (tail). She is still of a good weight and size at over 15ft and heavily built, so she is evidently feeding well and very capable of turning on the speed when needed. I’ve wanted to see her for two seasons and today was my first encounter with her! Not a day I’ll forget anytime soon! This is our third day of diving and we had a visitor shark at Guadalupe that I had not seen for a long time: “Lucy.” Her caudal fin is deformed and the first time I saw her 10 years ago, I thought she would not survive and would die soon. I was obviously wrong as she is now fat and bigger! She looks much older with a lot of scars and she swims with her mouth more open than other sharks. She also swims quite slow (for a shark!) with the company of dozens of pilot fish. Divemasters Casey and Martyn have a theory that because of her slow swimming, she needs to keep her mouth open to filter more water to breath. Whatever the reason is I’m happy to see her. 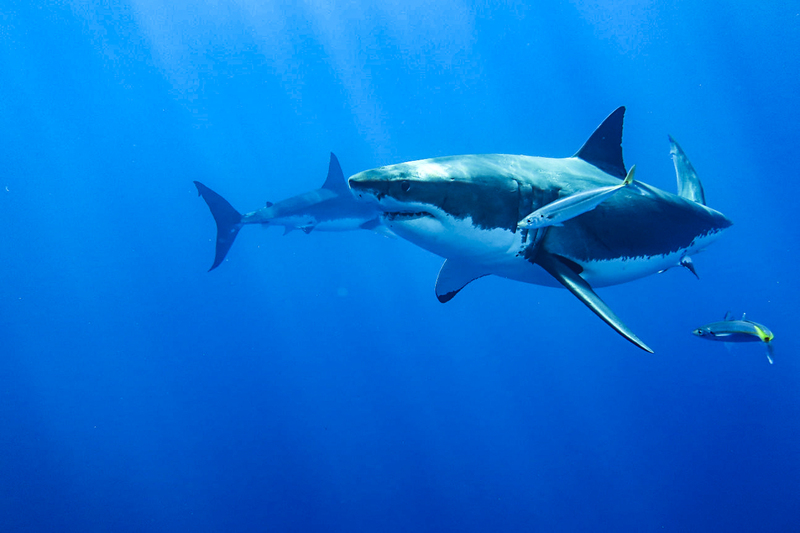 It confirms why great whites have been in this ocean for millions of years. The water temperature is 21°C and visibility is at 30m.